Over 5 years later and Gibbys Electronic Supermarket is going strong. Now 52 years in business and continuing to grow. Thank you Niagara, Thank you Canada for the support. Gibbys Electronic Supermarket will continue to strive to offer the best prices, the best products and the best services we can possibly offer day in and day out. 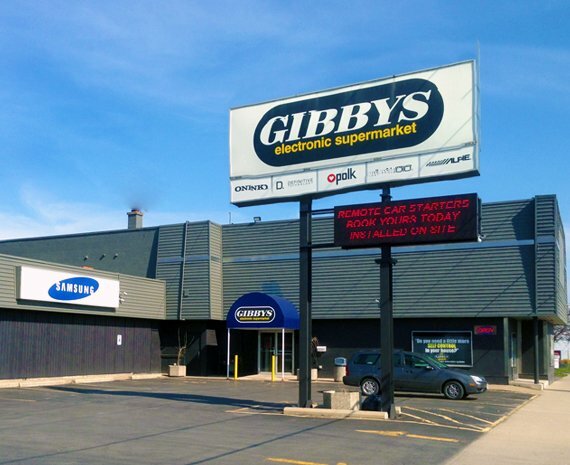 Two electronics stores — Gibbys Audio Video and Electronic Supermarket of St. Catharines — have joined forces. Rod Hebert, owner of the Electronic Supermarket, is now a partner in Gibbys Electronic Supermarket and General Manager of the custom/commercial installation division. Electronic Supermarket which was located at 28 Dunkirk Rd. closed in November 2010, with all merchandise and staff moved to Gibbys Electronic Supermarket at 55 Geneva St. Duane Gibson, General Manager of Gibbys Audio Video, said the uniting of the two companies made sense. Gibbys has strength in retail “and with our website, we’re coast-to-coast with our online sales,” he said. Electronic Supermarket itself is well-known for custom and commercial installations. “By joining forces and letting Duane focus on growing retail and Rod on growing the custom and commercial components, it will benefit all our clients,” said Hebert. Gibbys Audio Video has in business since 1966, and Electronic Supermarket began as Dino’s Sound Cove in Niagara Falls in 1964. The new store changed its name over to Gibbys Electronic Supermarket in November 2010. It will continue to offer products and services like home theatre systems and components, audio components including home audio receivers, amplifiers,speakers, HDTV’s and home theatre projectors, car audio products and installation services plus much much more. Come in and see us at our convenient location 55 Geneva St. at the corner of Church and Geneva street, in the heart of St. Catharines. Or call us at 905-685-7611 or toll-free at 1-877-761-6354.